This website provides detailed bibliographic, publishing, and price information for books and pamphlets written about the Lost Dutchman Mine and other related topics. 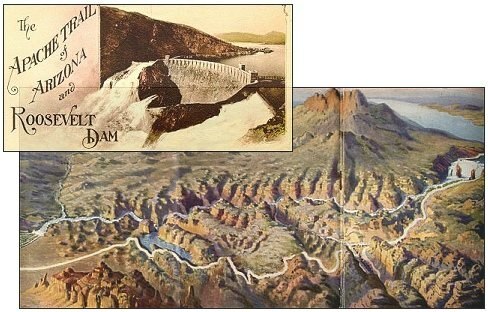 Note: I do not list newspaper or magazine articles, nor the multitude of lost mine and treasure books that mention the Lost Dutchman. More extensive bibliographies are available (see Davis, Sikorsky, Probert, and Conatser). Core Works is the heart of this website, presenting books and pamphlets focusing exclusively on either Jacob Waltz, the Lost Dutchman Mine, or Superstition Mountain. Related material can be found in related works, fiction and poetry, juvenile fiction, western fiction, art, and maps. A publishing chronology is also provided. Each entry lists the original price, if known, and the used prices I've seen over the last twenty some years. For example, $1.50/ $5.00, $6.00 means the original price was $1.50, and used copies were $5.00 and $6.00. Original prices are almost always taken from the books or pamphlets themselves, otherwise from Cumulative Book Index (CBI) or Books in Print (BIP). Bibliographic information from the OCLC database (OCLC) is noted. When the original price is unknown, and/or I've never found a copy for sale, a "?" is used. 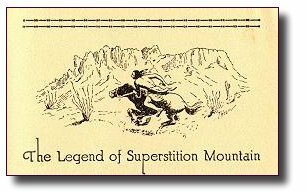 "SMHS" denotes the Superstition Mountain Historical Society reprint series. These range from serious assessments to just noting a work's wonderful eccentricities. I do try to take each work as seriously as it takes itself, though obviously this isn't always possible. I also try not to be too critical. After all, many of these books and pamphlets represent the work of a lifetime for their authors - dedicated Dutch Hunters one and all. "RB" denotes a quotation from Robert Blair's book. "CM" denotes comments from Estee Conatser's and Karl von Mueller's work. "GD" refers to information Greg Davis provided.